Very simply put, wherever you live, make sure your environment carries the Yin and embraces the Yang. Now, what does that mean in practice? Simple: A Feng Shui house or apartment block should be protected from the wind and the cold, while facing the warm sun. This is also called “Hide from the wind and gather the Qi”. 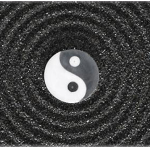 That way, Yin and Yang are in balance and positive Qi can be collected to benefit your property. An ideal site for a property of any kind would have a mountain in the back (Black Tortoise) to offer shelter and support to its occupants; a landform embrace on the left and the right by means of smaller hills or mountains (called Green Dragon & White Tiger); and a smaller mountain at the horizon in front of the house (also called Red Phoenix). This kind of land formation is considered gentle and full of positive Qi, embracing and protecting the property nestled within. In an urban environment we often can’t see the mountains around us and hence have to observe the buildings that surround us instead. This is not ideal, of course, but on a very basic level it will do. The same principles apply – have a higher building in the back, buildings on both sides embracing yours, and another one in front (ideally lower than the one in the back), locking in the positive Qi. If you find that your property is located in a configuration like this – be that in a city or, even better, within its natural environment, the Feng Shui potential of your property will already be highly prosperous. All you need to do then is to fine-tune and optimize it – and that’s what Suzhong Consulting is here for.